Simplifying the Diagnosis of P.A.D. The Vantage ABI is an innovative system with a cuff-based technology for performing the ankle-brachial index (ABI) exam to assist in the diagnosis of peripheral arterial disease (P.A.D.). The Vantage ABI provides accurate determination of the ABI across the full range of P.A.D. 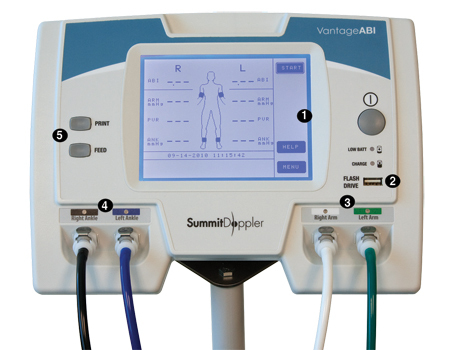 Striving to provide new technologies to better serve the needs of health care providers and patients, Summit Doppler developed the Vantage ABI. This innovative cuff-based system uses Digital Fourier Oscillometric or DFO waveform analysis, which Summit Doppler co-invented with researchers from the Cleveland Clinic where the technology was clinically validated. This new technology is a significant improvement in ankle and pressure determination and P.A.D. assessment over traditional forms of oscillometric ankle pressure estimation. The Vantage ABI is well suited for the ABI exam. The system compares the blood pressures at the ankles with the higher of the two arm pressures and estimates the systolic blood pressure for each limb. A significantly reduced ankle pressure results in a low (<0.9) ABI value, indicating P.A.D.